Start with an article by Lars-Erik Sondenkamp about modeling a town called “New Eastbrook, a Town Along the NYC Mainline’. Lars-Erik is a NYC fan living in the Netherlands and in this edition he tells us about modeling the NYC in N-scale. 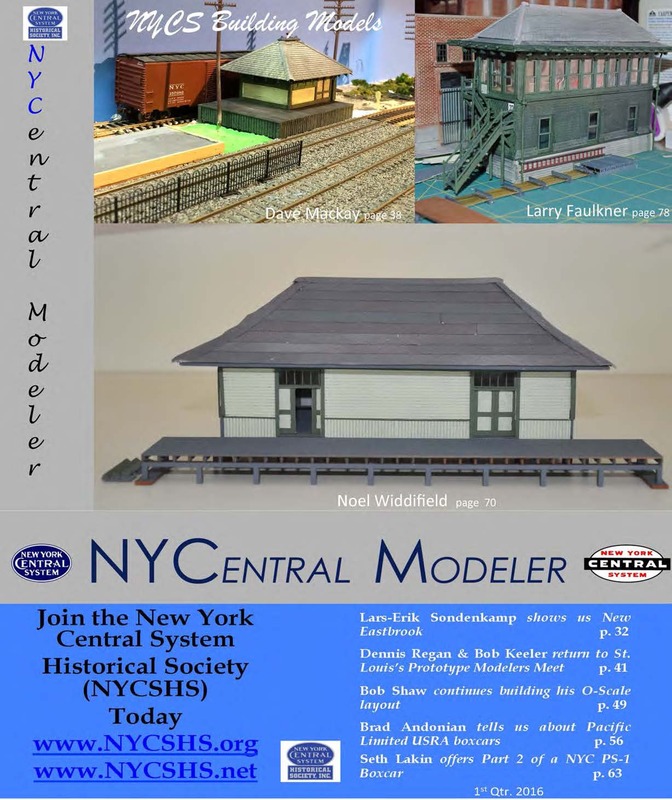 NYCSHS Director, Dave Mackay, writes about how he modified one of The TrainMaster, LLC, Section House kits in “Modeling a Small NYC Freight House’. Dave is the Chair of the NYCSHS Membership Committee and a member of the NYCSHS Modelers Committee. This is the second article in NYCentral Modeler for Dave. Dennis Regan & Bob Keeler bring us up to date with their report from the 9th Annual St. Louis Prototype Modelers Meet. You will see several NYCS models they saw there and here about how the participated again this year. Bob Shaw returns to tell us about “Building a Simple O-Scale Lift-Out Bridge on his growing O-Scale layout. Brad Andonian writes about “Pacific Limited O-Scale Boxcars (USRA Variants)” showing us some of his skills in painting and lettering these beautiful O-Scale brass models. Of course, you will also find our regular features: “What’s New”, “NYCSHS RPO” and “The Observation Car” in this 91 page edition. This entry was posted in Members Information, NYCentral Modeler, NYCS News, NYCSHS Models, NYCSHS News. Bookmark the permalink.